Ever feel like ripping it up? 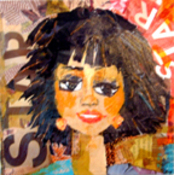 This is a "can't-miss, no fail" approach to multi-media collage, that has a therapeutic effect on everyone. Tearing results in a free, spontaneous creation. Using the colors found in various papers and magazines, an assemblage is created by tearing and layering. Whether abstract, or recognizable subject matter, the results are exhilarating and FUN! This fast-paced class flies by in a joyful way! * A huge variety of papers & magazines will be available, as well as collage supplies. Just bring the surface you would like to work on. Instructor suggests a gallery wrapped (thick) canvas or sturdy canvas board, 12x12 size or 11x14. Surfaces will be available for purchase if needed. Your journal to share or add to. You may want to bring any kind of mixed media items, markers/pens, stamps (some will be provided to share), watercolors, pastels, colored pencils, hole punches, ephemera, or whatever? Various papers, magazines with porous paper, maps, bookpages, newsprint,/newspapers, (heavy papers are more difficult), an apron or cover-up, rubber gloves. It's Jacki's goal that ALL students in this class enjoy this approach and have results they feel good about! Please join us and "rip it up"! !